Physical characteristics: Rufous-capped nunlets have a small body, slender bill, deep chestnut crown (top of head), a gray face, nape (back of neck), and sides of the breast. They have plain dull-brown upperparts, rufous (reddish) underparts, a whitish belly, and dark brownish gray feet. Adults are 5.3 to 5.5 inches (13.5 to 14.0 centimeters) long and weigh between 0.5 and 0.8 ounces (14 and 22 grams). Geographic range: They range (east and west) from eastern Peru to western Brazil south of the Amazon River, and (north and south) from northern Brazil to northern Bolivia. Habitat: Rufous-capped nunlets live in the mid-levels and undergrowth of humid forest edges, secondary forests, streamside forests, and the banks of the black waters (igapo) of the Amazon River area. They prefer areas that surround rivers and contain bamboo trees. Diet: It is believed that they eat mostly insects. Behavior and reproduction: Rufous-capped nunlets are usually found alone or in pairs. 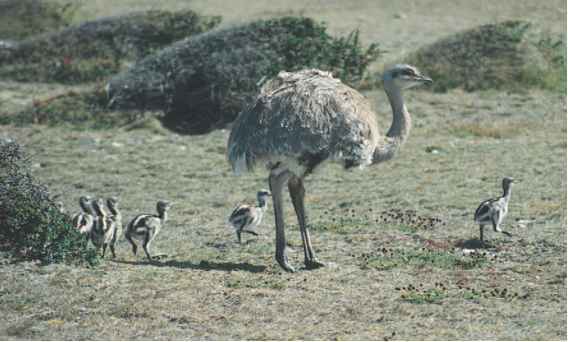 They are generally found sitting quietly in low vegetation where they search for food. The birds give out a long series of sharp, clear, short whistles sounding like "fwick!-fwick!" that are softer and lower in sound near the beginning and end. Little information is available about reproduction. It is known that nests are often made in holes in earthen banks or trees. 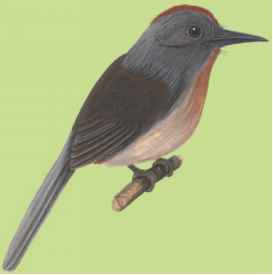 Rufous-capped nunlets and people: There is no known significant relationship between people and rufous-capped nunlets. Mangoverde World Bird Guide. "White-necked Puffbird Notharchus macrorhynchos." http://www.mangoverde.com/birdsound/spec/spec 100-1.html (accessed on July 19, 2004).